When Gordie Bannerman (left), who now lives on Vancouver Island, and Orme Payne, who lives in Port Moody, B.C., meet for lunch in Horseshoe Bay in West Vancouver November 7, 2015, the pair share stories and memories of the war and rekindle their 82-year friendship. The overnight firefight had been fierce. The last serious battle for Canadian troops on their bloody, eight-month slog through Holland, it erupted when several squads of Germans stumbled unexpectedly across a Canadian contingent digging in around the Dutch village of Otterlo. The ensuing mayhem included vicious hand-to-hand combat, as soldiers on both sides surged back and forth in the dark, before the Canadians prevailed. Early on, Gordie Bannerman saw the headquarters housing his closest boyhood chum go up in flames. Mr. Bannerman and Orme Payne had grown up and gone right through the war together. Now, three weeks before VE-Day, he thought Mr. Payne was dead. Mr. Payne, meanwhile, heard that the artillery unit commanded by Mr. Bannerman had been overrun during the night. He thought his friend was dead, too. Next morning, after the smoke of battle had cleared and the roads lay littered with dead Germans, Mr. Bannerman witnessed someone advancing toward him across a field. "Is that you, Orme?" he called. It was. "God, I'm glad to see you," he said. "And I'm glad to see you," Mr. Payne replied. The two soldiers embraced in the middle of the field. They had survived. 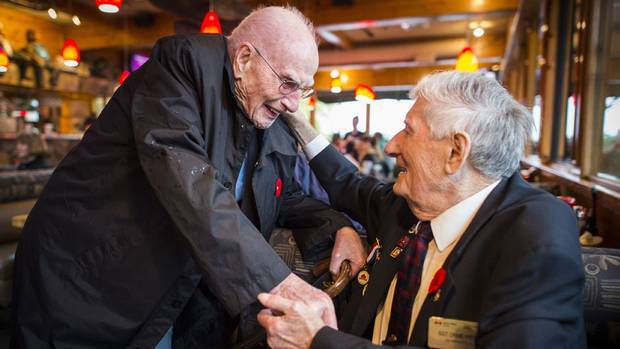 Canadian Army WW II veterans Orme Payne (left) and Gordie Bannerman met before the war and began an unwavering friendship that remains strong today. 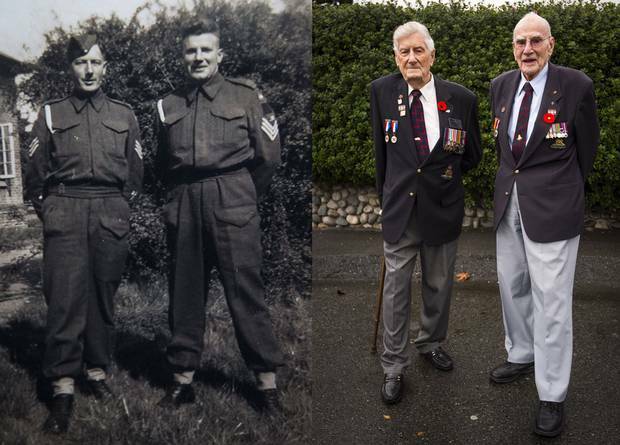 The pair, pictured in Aldershot, England in 1942 and in Horseshoe Bay in West Vancouver last week, still call each other several times a week. More than 70 years later, they still survive, and remain the very best of friends. First forged while farm boys in southern Saskatchewan, further tightened during five years of war, their extraordinary bond carries on. Mr. Bannerman, 94, and Mr. Payne, 93, continue to talk long-distance on the phone several times a week, swap the same old war yarns, and reminisce about life on the farm. Perhaps even more remarkably, of the 100 or so contemporaries who enlisted in the summer of 1940 at the closest recruitment post in Aneroid, Mr. Bannerman and Mr. Payne believe they are the only two left. They are at a loss to understand their twin good fortune. "Why are we the only two still around?" wondered Mr. Bannerman. "We just can't believe it." It has been an amazing journey. The two first met in the depths of the Depression one summer at a lake outside the village of Neville, 80 kilometres south of Swift Current. Mr. Bannerman remembers "a freckle-faced little fella." Mr. Payne recalls "this active little beggar, a bit on the nosey side." They hit it off. They were in the same grade in high school, played on the same baseball team (Mr. Bannerman pitched, Mr. Payne caught), and, when war came along, they signed up on the same day for the same regiment. Their enlistment numbers in the 60th Field Battery are one digit apart. Throughout the war, although they had different regimental responsibilities, they kept in touch and looked out for one another as best they could. One night, during the Canadian Army's grim, costly advance up the spine of Italy, Mr. Bannerman saved his friend's life. They were among an advance party bedding down in a farmhouse. Tired of the close quarters, Mr. Payne said he was going to sleep upstairs. Mr. Bannerman insisted that wasn't safe. He kept on and on about it. Finally, Mr. Payne gave up and stretched out beside Mr. Bannerman. A few hours later, the building took a direct hit. The second floor was smashed to bits. "The shell landed right where I was going to spread my bed roll. He saved my bacon, all right," said Mr. Payne. "Gordie likes to rub it in, but that was one time his nagging paid off." Mr. Bannerman now lives on Vancouver Island, Mr. Payne in Port Moody, B.C. When they meet up, as they did last week, it's as if they'd never been apart. Tales and wisecracks roll out like an assembly line. "God, you're looking good, Orme," said Mr. Bannerman, as he sat down. "Better get your eyes checked," advised Mr. Payne. They barely have enough breath between stories to finish their clam chowder. "Remember that time the cat got in old Charley Miner's outhouse…?" They laugh uproariously one more time at the memory. It's this familiarity with "home" that keeps their 82-year-old friendship alive. It also helped them through the terrible carnage of the Second World War. "Our bond is pretty hard to explain," said Mr. Bannerman, "but we know where our folks homesteaded. We know the buffalo trails, where the Indian teepee rings were. We walked the creek banks. We know what potholes the ducks would be in. It's a comfort." But the story still at the top of their list, the one both will be thinking of on Remembrance Day, is their fabled reunion in that field outside Otterlo, after each thought the other had been killed. "You just say to yourself, 'Oh God, is he gone?'" recalled Mr. Bannerman. Mr. Payne was thinking the same. "I spent half the night wondering about Gordie. We'd been through so much together." At a large gathering a few years ago to celebrate Mr. Payne's 90th birthday, Mr. Bannerman told the story for the umpteenth time. When he was done, the two old vets hugged again. "Everyone was in tears," Mr. Bannerman said.